Badly dropped ship anchor has damaged an undersea cable located between Alexandria, Egypt, and Palermo, Italy. The disruption slowed services in India, Egypt and Saudi Arabia and shut down at least one internet service provider in the United Arab Emirates. A breakdown in an international undersea cable network disrupted Internet links to Egypt, India and Gulf Arab countries on Wednesday. Experts in Egypt estimate that it will take several days for services to return to normal. It was not immediately possible to gauge the impact of the disruption on financial institutions. – 70% of Egypt’s Internet network was down according to the Minister of Communications and Information Technology, emergency teams were trying to find alternative routes, including satellite connections, to end the disruptions. Service, however, was still slow or completely stalled by late afternoon Wednesday. For some reason ships were asked to anchor in a different place to normal – 8.3km from the beach. One of the ship’s anchors cut one cable but there are multiple cuts. 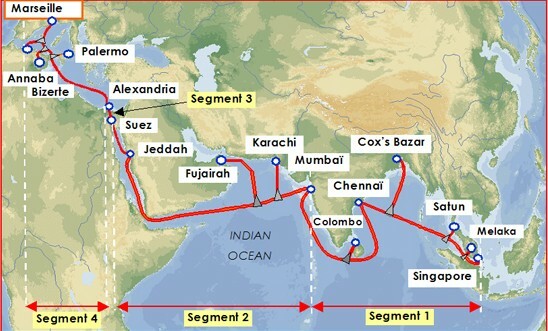 One of the damaged cables stretches from France through the Mediterranean and Red Seas, then around India to Singapore. The cable, SEA-ME-WE-4, is owned by 16 telecommunications companies along its route. As the graphic above illustrates, the system comprises 4 segments, including 3 submarine segments and one segment on land (joining Suez in the Red Sea to Alexandria in the Mediterranean). The second cable, Fiber-Optic Link Around the Globe, or FLAG, runs from Britain to Japan. Apparently, some Internet service providers first claimed there was no disruption to customers as a result of the cable cut near Alexandria, all thanks to a diversity in cable routes and service providers in the network. But for companies that rely on outsourced IT and customer support services in countries like India, the disruption in service is expected to impact business and has already interrupted service levels. A repair ship is en route to assess the damage. Unfortunately, it could take as long as two or more weeks before the cable can be repaired, and regular Internet service restored to the region. As a result, Internet access – including email to and from the affected regions – may be spotty, shaky, and sporadic for at least the next 10 – 15 days for sure. As welll, Egypt’s financial markets were interrupted and at times trading was done blind. This case illustrates that our ever greater dependence on international communication networks makes us ever more vulnerable against these service interruptions. As well, this can happen again and again as the earlier Taiwan’s 2006-12-26 incident illustrated so drastically. And no, we are not redundancy compliant when it comes to our critical communication infrastructure looking at this incident – caused by a badly dropped ship anchor that damaged an undersea cable. The ‘degraded’ performance has resulted in British Airways admitting that its call centers have been affected by the outage. What would happen if two MORE of these cables are being disrupted – can those call centres still work in India or elsewhere in that region? Whatever benefits gained by outsourcing certain services may be offset by events like the one described above. But is it worth taking on such risks that are hard to assess and even more difficult to protect against? Redundancy compliance is expensive and takes much investment in infrastructure before anybody could even dare to guarantee it…. so decide carefully how far away from your customers you want to locate critical components of your business (e.g., software maintenance or customer call center).